You watched the ceremony, you analyzed the speech, you likely teared up. But what did you miss watching it all unfold on TV? Jada Yuan, embedded in the crowd, reports. -- Jay-Z and Beyonce sitting in the same row as Diddy in the front section, about twenty rows back from the podium, but not in the grandstand. Beyonce wore sunglasses but no hat. 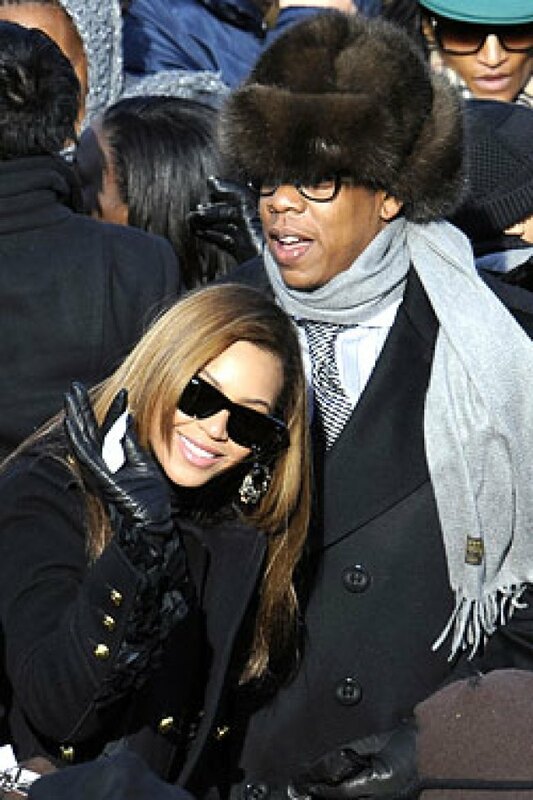 Jay-Z wore the most ridiculously huge fur hat we've ever seen, which became less and less ridiculous-looking as our body temperature reached hypothermia levels. -- Oprah shaking fans' hands as she walked to a prime seat (though not as good as Jay-Z and Beyonce's) with Stedman Graham and Gayle King. -- Attention-seeking senators peering over the ledge of the Capitol balcony and waving at their public as if in some ticker-tape parade. Chris Dodd was probably the most egregious offender, clinging to the marble railing. "It's like he's finally living out his presidential fantasy," we overheard someone say. John Kerry and Chuck Schumer were equal offenders, though they waited until the end of the ceremony. -- Roland Burris in a newsboy cap briefly joining said balcony addicts, though, endearingly, looking like a kid who just couldn't believe he got to be up there. When we shouted, "Wave to the camera, Senator Burris!" he seemed surprised and flattered, and obeyed. -- John Cusack on the Senate side of the grandstand, one row above pro-basketball player turned Sacramento mayor Kevin Johnson. Cusack wore spylike dark sunglasses. When he placed them on top of his head to watch the ceremony, his hair was so big, the sunglasses simply disappeared. -- Glenn Close smiling at any and all strangers, saying, "Hey guys, isn't this great?" while walking to her seat at the WAY back of a section filled with African-Americans who'd won tickets through their congressional representatives. A very friendly Halle Berry and Forest Whitaker later joined Close in the back. -- Dozens of African-American 12-year-olds screaming out Usher's name as he walked past, and Usher ignoring them while walking to his not-amazing seat, head down. "So you're too good for us? We're your people!" someone shouted. -- Denzel Washington likewise refusing to acknowledge the many fans yelling out his name. "Is he really not going to look at us?" someone asked. -- Billy Baldwin and Ellen Burstyn complimenting the crowd as they walked through to not-great seats. "It looks like you guys have a great section," said Baldwin. "Got any more seats up here?" -- Tyra Banks wearing the least inconspicuous sun hat ever, and flanked by two security guards (who we hope are huge Obama fans, because otherwise giving them those seats is just wrong). "Your ratings aren't good enough to have two security guards," one heckler said. -- Bruce Springsteen standing up with his entire family at the start of Obama's speech and moving to the front of his section. He stood for the rest of the speech, though was careful not to block anyone's view. He also raised a fist for the crowd. -- Diddy, Halle Berry, and Chris Tucker stepping into the aisles to take their own snapshots of Obama. -- The House side of the grandstand chanting "Rahm-bo!" when Rahm Emanuel walked onstage with the rest of the new Cabinet. Then starting a chant of "Steny, Steny" when Steny Hoyer was announced. (If we had a buddy named "Steny," we'd chant his name all the time, too.) "The House is always so rowdy!" observed one Capitol Hill reporter. "Are they drunk?" asked another. -- Chris Tucker getting a little emotional. We ran into him after the ceremony, but he wouldn't cop to our previous observation. "I can't believe I'm here," he said. "But I only cry on the inside." -- Christopher Hitchens, trying to squeeze into our packed subway car and seriously considering abandoning his three friends who didn't make it on, before aborting the mission.